Here’s your chance to help the environment and meet your neighbors, all at one time! 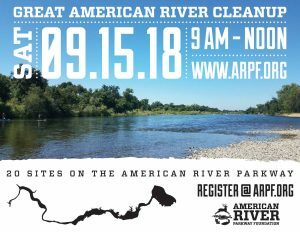 The 2018 Great American River Clean-Up is happening on Saturday, September 15, 2018 from 9 am to noon. BRECA is the steward for Mile 12 South of the American River. Meet this year’s coordinator, Lori Christensen, in the parking lot of the Gristmill access at 9 am on Saturday morning, 9/15/2018, to join in the fun! Be sure to bring a hat, gloves, sunscreen, and water. Let’s clean up our parkway!